Is it time to replace your Chromatography Data System? to meet your needs and not equipped to adapt to your future growth, then you should consider replacing it. A laboratory can realize tremendous value by selecting a CDS most appropriate for its needs. Improved workflows, increased operational efficiency, and enhanced asset utilization are clear examples. Replacing a CDS offers the opportunity not only to equip your laboratory with a technologically advanced chromatography control and data management system; but also to establish a new business relationship and interactive partnership with a vendor that has knowledge of market trends, application needs, and regulatory changes; and that can support your lab by providing consultation, education, products, training, and services. In addition to the many benefits, there are three main drivers for considering a new CDS. This informative white paper entitled, Is It Time to Replace Your Chromatography Data System?, outlines these key drivers and provides practical “factors to consider” that address the most common concerns. 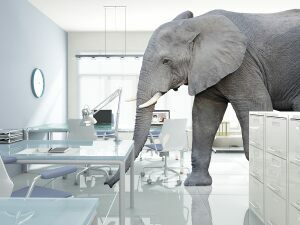 It’s time you make an informed decision to replace your existing Chromatography Data System— consider all the facts and quit ignoring the elephant.